Position: Denggle > News Home > Industry > Claesson Koivisto Rune's Disc-shaped Optunia Lights are "devoid of unnecessary detailing"
The Optunia range, which the Italian lighting brand unveiled at Milan design week, features table, wall and floor lamps as well as pendants. Each light has rotating discs linked by a single joint. This allows the light source, which is housed in a metal ring, to be turned to create different effects depending on the relative angle of the mirrored disc it's attached to. "One or two light discs give the user many ways and possibilities of directing the light," said Claesson Koivisto Rune, which named the collection to reference the opuntia ficus-indica plant – a type of cactus with large rounded pads. The Stockholm studio has completed several projects this year, including a chevron-patterned spa and its first furniture collection for Swedish brand Dux. The Stockholm studio kept the Optunia design as pared-back as possible, using "elemental volumes and geometry devoid of unnecessary detailing". 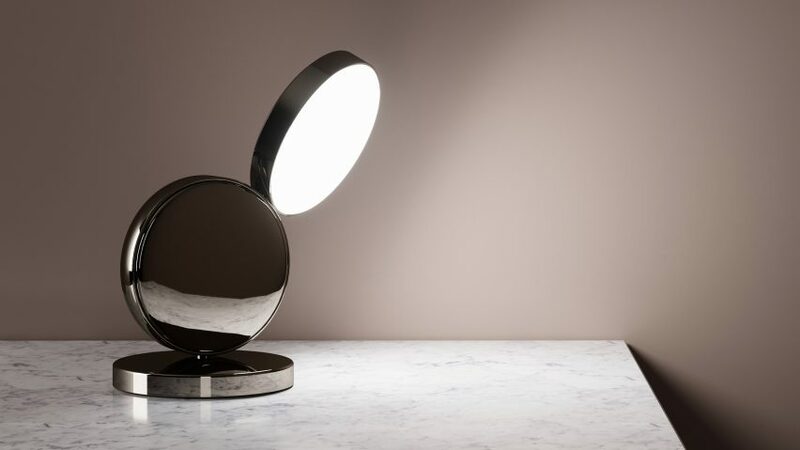 Bedside lamps sit on a mirrored circular base, while the floor lamps rest atop slender metal stems, which are also used to support the pendant. The range is available in opaque white or as a mirrored chrome edition. Milan design week saw the launch of several lighting collections, from lamps that resemble birds perched on overhead wires designed by Neri&Hu to a set of ring-shaped pendants by Resident that connect together to form a "never-ending chain of light". Formafantasma's lighting design turned the power cable into a sculptural feature, while Child Studio's set of globe-shaped lights seemed to be precariously frozen in time.